Subsequent to an uptick to 58 index points in the first quarter of this year, the Agbiz/IDC Agribusiness Confidence Index declined to 54 in the second quarter. With the results still above the neutral 50-point mark, albeit having declined marginally, this means that the agribusiness sector is still optimistic about business conditions in South Africa. The survey was conducted between 04 June and 15 June 2018 and comprised of agribusinesses operating in all agricultural subsectors across the country. Amongst the ten sub-indices making up the Agbiz/IDC Agribusiness Confidence Index, the quarterly decline was broad-based, with the exception of the general agricultural conditions sub-index. The optimism in this particular sub-index was underpinned by prospects of above normal rainfall in the Western Cape province within the next three months, which in turn, should support winter crops and horticulture fields, as well as favourable drier conditions for harvest activity in summer crop regions. Meanwhile, the turnover, net operating income, market share, employment, capital investment, the volume of exports,economic growth, debtor provision for bad debt and financing costs sub-indices were the key factors underlying the decline in confidence from the previous quarter. Following a 10-index points increase to 78 in the first quarter of 2018, confidence regarding the turnover sub-index deteriorated to 64 points in the second quarter of this year. This could partially be explained by the expected decline in agricultural output this year, although some field crops are still at above-average levels, particularly grains and oilseeds. In a similar trend with the turnover sub-index, confidence in net operating income sub-index declined by 9 index point to 58 in the second quarter of 2018. The market share of the business sub-index declined by 15 points from the previous quarter to 53. This despondency is due to a delayed harvest period in summer crops on the back of the late start of the season, as well as the aforementioned expected lower agricultural output. Case in point is the horticulture industry following the Western Cape drought, and to a lesser extent in the summer crop areas. Confidence regarding employment in the agricultural sector retreated by 19 points to 56, which is the lowest level since the first quarter of 2017. This is unsurprising following a 3% y/y decline in agricultural employment in the first quarter of the year to 847 000 jobs. Moreover, the above-mentioned decline in agricultural output will translate to reduced activity in the fields, which could limit the chances of increased employment in agriculture in the near term. After improving to 68 points in the first quarter of 2018, the capital investments confidence declined by 4 points in the second quarter of 2018 to 64. The uncertainty regarding land reform policy was cited by respondents as one key factor behind the deterioration in confidence. The perception regarding export volumes sub-index deteriorated further by 17 index points in the second quarter of 2018 to 39. This is largely due to decline in horticultural products output, as well as regulatory issues in livestock products such as ostrich meat (fresh and pre-cooked), which has been restricted to accessing the European Union market sine since 1 March 2018. The perception regarding economic conditions weakened by 18 points in the second quarter of this year from the previous quarter to 50. The respondents’ perceptions could have been influenced by the recent poor GDP data for the first quarter of 2018, which showed a -2.2% quarter-on-quarter seasonally adjusted and annualised, compared with a consensus expectation for -0.5%. The debtor provision for bad debt sub-index lifted by 10 index points from the first quarter to 50. This still mirrors the tail-end effects of the drought, particularly in agribusiness operating in the Eastern and Western Cape provinces. The financing costs sub-index also lifted by 34 index points from the previous quarter to 64 in the second quarter of this year. 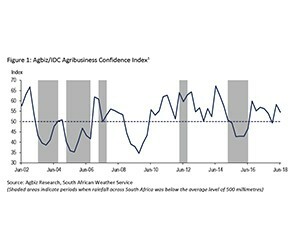 Although the Agbiz/IDC Agribusiness Confidence Index results showed a marginal decline from the first quarter, there is still some optimism regarding business conditions in the South African agricultural sector. The forecasts of above-normal rainfall in the Western Cape province bodes well with winter crops and also horticulture industry, following months of persistent dryness in that province. The summer crop harvest activity is also on good footing supported by cool and dry weather conditions across most parts of the country. ‘The uncertainty regarding land reform policy, particularly expropriation without compensation, remain a key risk that could potentially undermine investment in the agricultural sector. At this point, however, farmers are somewhat in a wait and see mode. We have not seen a notable dent on investments in the sector yet. The Agbiz/IDC Agribusiness Confidence Index reflects the perceptions of at least 25 agribusiness decision-makers on the ten most important aspects influencing a business in the agricultural sector (i.e. turnover, net operating income, market share, employment, capital investment, export volumes, economic growth, general agricultural conditions, debtor provision for bad debt and financing cost). It is used by agribusiness executives, policy-makers and economists to understand the perceptions of the agribusinesses sector, and also serves as a leading indicator of the value of the agricultural output while providing a basis for agribusinesses to support their business decisions.